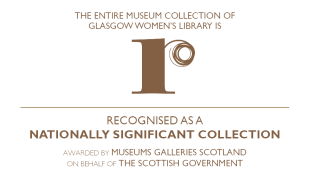 Glasgow Women’s Library is the only Accredited Museum in the UK dedicated to women’s lives, histories and achievements, with a lending library, archive collections and innovative programmes of public events and learning opportunities. Glasgow Women’s Library is a Registered Company No. 178507 and is a Scottish Charity SC029881, regulated by the Scottish Charity Regulator (OSCR). Glasgow Women’s Library is based at 23 Landressy Street, Bridgeton, Glasgow, G40 1BP. You can call us on 0141 550 2267, or email us at info@womenslibrary.org.uk. If you have any questions, please don’t hesitate to get in touch with us at info@womenslibrary.org.uk or call us on 0141 550 2267. We’re happy to talk through our data protection policies and procedures and what they mean for you. Glasgow Women’s Library respects your rights over your personal data. You may exercise these rights by emailing info@womenslibrary.org.uk or calling 0141 550 2267. Please note that they are all subject to our legal obligations and our work in the public interest as an archive and museum. Request copies of the personal data we hold about you in order to transmit this information to another service provider. Withdraw your consent from any consent-based processing of your personal data. Object to any processing of your personal data that has its basis in legitimate interest. Challenge the accuracy or lawful basis of the processing of your data and request a temporary restriction of this processing. Request the deletion of all the personal data that we hold about you and an end to the processing of this data. Please note that we may be required to store some of your personal data after this request to comply with our legal obligations. To act on any of these rights, please contact Glasgow Women’s Library at info@womenslibrary.org.uk or write to Glasgow Women’s Library, 23 Landressy St, Bridgeton, Glasgow, G40 1BP. There are lots of reasons why you might want to get in touch with Glasgow Women’s Library. You might have an enquiry about research, venue hire, our Inspired! palette, or a more general enquiry, and we want to make sure we’re able to respond to you. As part of the conversation between us, we may ask you for: your name, your organisation, your email address, your address and your contact number. We process this information to pursue our legitimate interests, as you have got in touch with us and we want to respond to your enquiry. We use your personal data to respond to your enquiry. We may also record your enquiry for our records, so that we can see how the Library is being used and how this is changing through time. This information informs our development in line with our Strategic Plan, our Vision and our Core Values. In some instances, we may get in touch with you after your enquiry if we think you will be interested in an opportunity or event with GWL. For example, if you enquire about a group visit and we are offering group tours for an exhibition, we might get in touch to ask if you would like to join one. We will only get in touch with you about opportunities specific to but outside of your original enquiry within 3 years of your original enquiry. We will not add you to our mailing list or membership list unless you request to be added. We look after your data with the utmost care and ensure that your privacy is respected at all times in line with our policies and procedures. We treat all information that you provide as confidential, and your data is stored securely. We retain your personal data for our records in order for GWL to learn how people are using the Library so that we can improve our services in line with our Strategic Plan, our Vision and our Core Values. We may also use this information to report to our funders or in funding applications, but in these instances it will be anonymised. You can ask us to delete this information at any time by getting in touch with us. Your data is treated confidentially and we will not share it with any third parties. If we use this information for funding purposes, your data will be anonymised. If you join the Library as a Borrower, we may ask you for: your name, address, email address, and telephone number. If you join the GWL mailing list, we may ask you for: your name and email address. We process this information with your consent. We will add you to the mailing list or register your membership if you have actively asked us to do so. We use your personal data to process your membership request so that you can borrow books from the GWL collection using our Library cataloguing system. We will use your personal information if we need to get in touch with you about overdue loans or books you have requested. If you join our mailing list, we will use your personal information to send out a monthly GWL newsletter to the email address you provide. This gives information about upcoming events in our programme and Library news. Occasionally we may send special newsletters about GWL or GWL events if we think that you would appreciate receiving the information, for example, news about an exhibition preview that was not included in the official GWL programme. We will retain this information for as long as you are happy for us to keep it. You can unsubscribe from our mailing list or membership at any time. We may retain your associated personal data for our records and for anonymised reporting to funders. Your involvement with GWL is part of our story and history as a Library, Museum and Archive. Retaining your data enables us to reflect on our engagement and develop as an organisation in line with our Strategic Plan, our Vision and our Core Values. If you would like us to delete this data, please get in touch. Your data is treated confidentially and we will not share it with any third parties. If you book to attend an event at Glasgow Women’s Library (or an event organised by/with GWL but at another venue), we may ask you for: your name, address, email address, and phone number. If you book via a website for a paid event, you will be directed to PayPal to make the payment. If you attend an event, we may take photographs. When we are taking photographs for potential use in promotional materials in which you can be identified, we will do this only with your permission and you are under no obligation to provide this. If you sign a permissions form, we will ask for your name, your signature and the first half of your postcode. At the end of an event, we may ask you to complete an anonymous Equal Opportunities Monitoring and Feedback Form. You are under no obligation to complete this. The information we ask for includes: your age, postcode, event attended, event feedback, gender identity, sexuality, information on health conditions or disabilities, ethnicity, and religious identity. This information is provided and processed anonymously. We process your booking information by contractual obligation. We process the information you provide as part of your photography permissions with your consent. We process your sensitive data with your consent and for equal opportunities monitoring. If you book to attend an event at Glasgow Women’s Library (or an event organised by/with GWL but at another venue), we will use this information to process your booking and to contact you with information about the event. If we take photographs at events, this will form part of our growing archive which records the activities, projects and exhibitions at Glasgow Women’s Library. If you have given your permission for a photograph to be taken where you can be identified, it may be used in promotional materials, such as in our printed programmes, websites or in outreach presentations. If you sign our photography permissions form, we will use this to record which photos we can use in promotional material, and to record attendance for events. If you complete an Equal Opportunities and Monitoring Form, we will use this information to reflect on feedback provided so that we can improve, develop as an organisation and respond to user suggestions and comments. We also use the information to reflect on the diversity of our users, to develop our work and engagement in line with our Equality, Diversity and Inclusivity Policy and Action Plan, and for reporting purposes. We look after your data with the utmost care and ensure that your privacy is respected at all times in line with our policies and procedures. We store photographs securely on password-protected hard drives and computers, and only use photographs (if they show identifiable persons) in promotional material where permissions have been provided. We store photography permissions forms securely. We store Equal Opportunities and Monitoring data securely and anonymously. Photographs from events form part of our GWL collection, as we are a Library, Archive and Museum. As such, we retain all photography permissions as part of our records. This information includes a name, signature and the first half of a postcode. The Equal Opportunities and Feedback information is provided, stored and processed anonymously, and forms a key element in how we develop as an organisation in line with our Strategic Plan, our Vision and our Core Values. We retain this data for our own records, reflection, development and reporting. In some instances, we may share photographs with external press for use in publicity. We also share photographs in our own promotional material, such as printed programmes, flyers, presentations and on our website. You can withdraw your photography permissions for specific photographs at any time. We may share photography permissions sheets (which show your name and first half of your postcode) and anonymous equal opportunities and feedback forms with partner organisations known to you when delivering joint projects. We won’t share your contact details with other organisations without your individual request or agreement. We do not share your personal data with any other third parties. If you order online from our shop, we will ask you for your: name, address, email address, telephone number. All shop orders online are processed via PayPal, we do not see or store any of your credit card or bank details. You have the option to create a personal account when you order online, and this will require the same information. The legal basis for collecting this data is for contractual obligations, for example we need to know your address so we know where to post your order. If you create a personal account, this is created with your consent. We use your personal data to process your order. We may need to get in touch with you about your order and/or post your order out to you. We only use this information to process your shop order. We look after your data with the utmost care and ensure that your privacy is respected at all times in line with our policies and procedures. Your details are stored in a secure and password-protected website. If you create a personal account on our website, we will only delete this on your request, or after it has not been used for 7 years. If you have been involved with the library in other ways, for example, attending events or joining the mailing list, the data you have provided in these instances may be retained in order to help us develop in line with our Strategic Plan, our Vision and our Core Values. We treat your personal data confidentially and will not share it with any third parties. If you become a GWL Friend, we may ask for: your name, address, email address, telephone number, and bank details. The lawful basis for processing the information you provide as a GWL Friend is by your consent and for legal obligations, for example we pass your details to HMRC for Gift Aid processing where applicable. We use your personal data to process your membership as a Friend, your Gift Aid if applicable, and your donations. With your consent, we will send monthly GWL newsletters which detail upcoming events and news from the Library. With your consent, we will also send you a bi-monthly Friends newsletter with preview information about our programme and to thank you for your support. You do not need to consent to join either newsletter in order to become a Friend. If you become a Friend via Direct Debit, we will send your bank details to your bank in order to process your donation. If you become a Friend via our website, PayPal will process your donation. We look after your data with the utmost care and ensure that your privacy is respected at all times in line with our policies and procedures. All data stored digitally is password-protected and the finance officer stores all paperwork securely. If you choose to no longer be a GWL Friend, we will retain your bank details for 7 years after the cancellation of your donations, due to financial obligations. If you become a GWL Friend via PayPal, your details are subject to their retention policy which you can find here. We may retain your name, membership information, address, email address and telephone number after this point for our records to inform the development of our Friends scheme in line with our Strategic Plan, our Vision and our Core Values, unless you request otherwise. We will send your information to your bank to process the donation and to HMRC to process Gift Aid where applicable. We do not share your personal data with any third parties. If you become a Women on the Shelf sponsor, we may ask you for: your name, address, telephone number and email address. Payments are made through PayPal or by cheque. We collect and process this information due to our contractual obligations, for example we need to get in touch with you in order to make sure your dedicated Women on the Shelf shelf/book/section has the correct name and your desired dedication inscribed on it. We also process this data for legal obligations, for example, we pass your details to HMRC for Gift Aid processing where applicable. We use your personal data to process your Women on the Shelf sponsorship. We will use your contact information to get in touch with you to make sure that the Library shelf/book/section that you’ve sponsored has the dedication you’d like marked on it. We also use your personal data to process your Gift Aid donation where applicable. If you sponsor a Women on the Shelf shelf/book/section on our website, PayPal will process your payment. We look after your data with the utmost care and ensure that your privacy is respected at all times in line with our policies and procedures. We treat all information that you provide as confidential, and your data is stored securely and for no longer than is necessary. If you become a Women on the Shelf sponsor via PayPal, your details are subject to their retention policy which you can find here. We will keep the personal information you provide as part of your Women on a Shelf sponsorship for 7 years after your shelf/book/section is completed. After this time, we will keep a record of your name, the shelf/book/section you sponsored, and its location within the Library. As the Library shelves change according to growth of book sections, we want to make sure we can always let you know where your sponsored shelf/book/section is. We will send your information to HMRC to process Gift Aid where applicable. We do not share your personal data with any other third parties. If you donate a book to the Library or an object to the Archive or Museum, we may ask for: your name, address, email address, and telephone number, alongside information on your donation. We process the personal information you provide as part of your donation to GWL to pursue our legitimate interests. You wish to donate an item to our collection and we would like to process this donation. Our Archive and Museum collections include books, objects, photographs, magazines, oral history interviews and digital data. The collection contains some personal information. The lawful basis for storing this information within our collection is in the public interest and in accordance with the Code of Ethics for Museums. If you donate a book to Glasgow Women’s Library, we will ask you to sign an agreement of use with GWL, detailing the transfer of legal ownership. We store this information so that we have proof of the agreement made at the time of donation. If you donate an object to Glasgow Women’s Library’s Museum or Archive, we use your personal information for our donor records and for the registration of the object in the collection. If you donate an item to the GWL collection, legal ownership of the item passes to GWL. The donor information we ask for is necessary as we are required to know the legal provenance of items donated. If you have donated an item to the collection, we may contact you to request further information about the donation. We may also need to contact you in order to act in accordance with any conditions stipulated at the time that the donation was made, for example, to inform you that the item is going on loan if you have requested to be informed of this as a condition of the donation. We will not add you to our mailing list or membership list unless you have asked us to do so. We will only contact you in relation to your donation. We look after your data with the utmost care and ensure that your privacy is respected at all times in line with our policies and procedures. As a Recognised Collection of National Significance and an Accredited Museum, we ensure we are safeguarding your donations and store all personal data securely. All personal information provided at the time of donating to the library is stored securely. All personal information attached to a donation with the Museum and Archive is stored securely. As it is in the public interest to keep this information, and it makes up part of our archives, we store this information for as long as the donation remains part of the GWL collection. Disposals of material from the GWL collection are processed in accordance with the Code of Ethics for Museums. Where possible, the donor is contacted in the event of a transfer or disposal. We will keep the agreement and personal information you provided at the time of a donation to the Library, for up to 5 years after the time of donation. If you have been involved with GWL in other ways, for example, attending events or joining the mailing list, the data you have provided in these instances may be retained in order to help us develop in line with our Strategic Plan, our Vision and our Core Values. If you have donated an item to the Museum or Archive, we may share your name publicly in relation to the items donated. This may be through social media channels, website, or exhibitions. We may share information about the item you have donated, for example, how/when/where it was used. We do not share your contact details publicly or with any third parties. If you are interested in working with Glasgow Women’s Library on a project or partnership, we will ask you to complete a ‘Working with GWL’ form. We will ask you for: your name, address, email address, organisation (if applicable), telephone number, website (if applicable), proposal information, and past relevant experience. If you have worked with GWL, we may ask you to complete an Equalities, Diversity and Monitoring survey within 18 months of your work with us. We may ask for: your gender identity, age, ethnicity, information on health conditions or disabilities, and sexuality. We ask for this information via an anonymous survey. We collect and process the information you provide as part of the ‘Working with GWL’ form with your consent, and we process the sensitive data you provide anonymously with your consent and for equal opportunities purposes. There is no obligation to complete the survey. We use the data submitted in this application to process your proposal to work with us and to respond to your application. We use the data provided in the anonymous survey as part of our report to Creative Scotland as a Regularly Funded Organisation. If you work with GWL, your project/event/exhibition will contribute to our own records as a Library, Archive and Museum and we may publicise your work with us via our website. We look after your data with the utmost care and ensure that your privacy is respected at all times in line with our policies and procedures. The ‘Working with GWL’ applications are shared only between the production and creative team at GWL and are stored securely. The Equal Opportunities and Monitoring information you provide is anonymous and stored securely. If your proposal is taken forward, we will retain the information from your ‘Working with GWL’ form for 5 years after the project. If your proposal is not taken forward, we will retain the information from your ‘Working with GWL’ form for 5 years after your submission. Once we have deleted your application, we may retain some information as part of our production records, for example, your name and relevant contact details, along with a summary of the work undertaken or proposed. This is for our own reflection and future project development. We may get in touch again if we feel you might be interested in working with us on a related future project. The data you provide anonymously will be shared with funders for reporting purposes. We do not share your personal data with any third parties. If you are interested in our Inspired Palette resources, which include workshops, training and film screenings, or hiring a space at Glasgow Women’s Library, we may ask you for: your name, organisation, email address, telephone number, and address. The legal basis for collecting this information is to pursue our legitimate interests and contractual obligations. Firstly, we want to respond to your original enquiry and let you know more about what we can offer. Then, if you choose to hire a space or book a workshop, we will use your personal information to process the contract, for example, to create invoices for payment. We use your personal data to get in touch with you and arrange the facilitation and payment of the venue hire or Inspired! Palette resource. We also keep a record of what organisations are using the Library’s Inspired! Palette Resources or venue hire, for our own processes of reflection and income generation development. We look after your data with the utmost care and ensure that your privacy is respected at all times in line with our policies and procedures. Your details are stored securely online and shared only with key members of the team. We will keep any financial information that you have provided for 7 years due to financial obligations. We may retain some information after this point, for example, name, organisation and contact details in order to help us develop in line with our Strategic Plan, our Vision and our Core Values. If you become an Adult Literacy and Numeracy (ALN) learner at Glasgow Women’s Library, we may ask for: your name, date of birth, address, email address, and telephone number. We will also develop an individual learning plan. We process this information with your consent. We use your personal data to record and develop an individual learning journey, and to get in contact to arrange learning sessions. We may also use your personal data anonymously in reporting to funders. We will keep your personal information and individual learning plan for as long as you continue working with the ALN team at Glasgow Women’s Library. If you no longer learn with us, we will retain your individual learning plan for 7 years, in case you wish to return to it within this time. We may keep some of your personal data, for example your name and contact information, for longer than 7 years for our own internal processes of reflection and development, unless you exercise your right to withdraw consent or be forgotten. With your consent, we may share your personal data with individuals or organisations that you have a relationship with, for example, an individual or organisation that referred you to GWL. We will not share your personal data with any other third parties, unless legally obliged to do so. If you apply to be a volunteer, intern or placement student at Glasgow Women’s Library, we may ask you for: your name, telephone number, address, email address, work experience, study information, and information on medical conditions. By completing this application form, you are consenting to us processing this information. You are under no obligation to complete all sections of the form, including the section on medical conditions or health requirements. We use your personal data in order to process your volunteer, placement or internship application, to invite you to interview and to ensure we have your medical conditions and personal information available while you are working with us, in case of emergencies. We look after your data with the utmost care and ensure that your privacy is respected at all times in line with our policies and procedures. We treat all information that you provide as confidential, and your data is stored securely by our Volunteer Coordinator. If you work with us as a volunteer, intern or placement student, we will keep your application for up to 1 year after you have left or are no longer involved with the Library. If you send in a volunteer, internship or placement application but are not successful, we will keep your application for up to 6 months after the application procedure is finished. If you have volunteered at GWL, we retain a record that you were a volunteer for our own archiving and development purposes. Likewise, if you have been involved with the library in other ways, for example, attending events or joining the mailing list, the data you have provided in these instances may be retained in order to help us develop in line with our Strategic Plan, our Vision and our Core Values. If you apply for a job at Glasgow Women’s Library, we may ask you for: your name, telephone number, address, email address, employment details, and qualifications. If you are successful in your application, we will ask you for your bank details. The lawful basis for processing this information is contractual, and, in the instance of enrolling employers in a pension scheme and payroll, and disclosing salary details to HMRC, it is by legal obligation. Once in post, we collect information on disabilities and health conditions of staff and ask for an emergency contact name and number in the event of an emergency, and so that we can respond appropriately to health and disability issues and needs. We process this information for your own health and safety under Employment Law and for our contractual obligations. We use your personal data to process your job application, invite you to interview, and to retain the information we require for contracts, payroll and pensions. If you work with us as an employee, we will keep your personnel file for 5 years after your contract has come to an end. After this time, your personnel file with be deleted. If you send in a job application but are not successful, we will safely delete your application after 6 months from the end of the application process. If you have been involved with the library in other ways, for example, attending events or joining the mailing list, the data you have provided in these instances may be retained in order to help us develop in line with our Strategic Plan, Our vision and Our Values. If you become an employee at GWL, we will share some of your data with our payroll and pension providers, and HMRC. We do not share your personal data with any other third parties.